Cover made from 100% recycled cardboard. Universal recycling symbol debossed on back cover. Innovative scored cardboard pen port stitched onto the front cover. 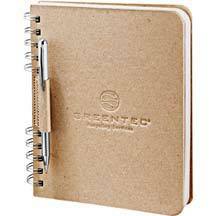 Includes 100 sheets of unlined recycled paper with recycling symbol printed on each page. Metal binder rings.